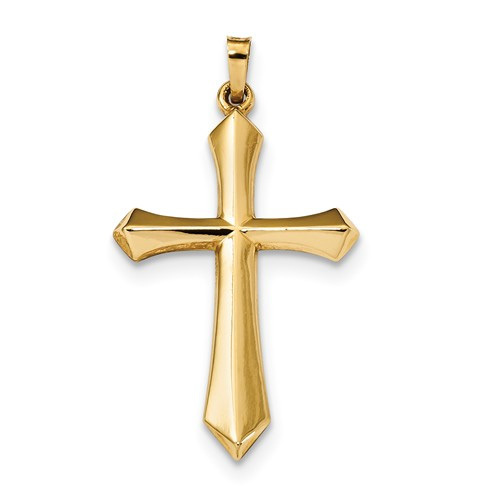 A 14k yellow gold cross pendant whose design is inspired by the Sword of the Spirit which is the Word of God. "And take the helmet of salvation, and the sword of the Spirit, which is the word of God:" (Ephesians 6:17). This gold cross is made for women or men and measures 1 1/4" tall (1 1/2" tall with hoop/bale) x 0.86" wide. Make it a necklace by adding a matching 14k gold box chain in either 18" or 20". This cross is made in the U.S.A.
We guarantee our Sword of the Spirit 14K Gold Cross Pendant to be high quality, authentic jewelry, as described above.